Time: Every Wednesday at 7:00pm. Suggested Koha: $10 standard / $5 low income / $2 financially struggling. Travel Times: Located in Laingholm. 10 minutes drive from Titirangi, Waima, Woodlands Park or Parau. 20 minutes drive from New Lynn, Blockhouse Bay, Green Bay, Glen Eden, Oratia, Waiatarua, Cornwallis or Huia. 40 minutes drive from Auckland City Centre. As many of us know, good things take time. Learning Tai Chi and Meditation is a rewarding long-term journey and it requires patience. Tai Chi is generally unsuitable for people with short attention spans, unless it is a trait that they genuinely want to change. The learning starts on this page so be sure that you have a good 15 minutes to read through the class and venue information to determine whether this class is right for you. Meditation is a practice of consciously directing our attention, as opposed to having our attention be occupied by the endless stream of unconscious thoughts. Tai Chi is a Chinese form of mindful exercise designed in accordance with the principles of Chinese medicine. As such, it is one of the safest forms of exercise that can be done well into old age and has numerous health benefits. This is well recognized in China where millions of people practice Tai Chi every morning in parks. Tai Chi or Tai Ji is translated as “opposite extremes” and can be interpreted as “balancing the opposites”. What’s commonly referred to as “Yin-Yang” is also called the “Tai Ji Symbol” and Tai Chi movements are based on this philosophy of interaction between opposing forces. Tai Chi is also known for cultivating the practitioner’s ability to feel and consciously direct their internal energy (called Chi or Qi). Improved balance, flexibility and coordination. Easing of tension in back, neck and joints. Improved mental clarity, focus and calmness. Deeper relaxation both physically and mentally. Improvement in posture and faster recovery from injuries. Increased awareness of the body and its internal energies. Better blood circulation contributing to health and longevity. Advanced practitioners can also use Tai Chi for self-defence. Tai Chi is considered an internal martial art because it relies on accuracy rather than on physical strength. However, most people practice Tai Chi for its health benefits. Tai Chi is the opposite of a work-out because the aim of Tai Chi is to perform the movements with the minimum amount of strain, minimum effort and full attention. Tai Chi is a relative of Chi Gong / Qi Gong and utilizes the same understanding of internal energy. Qi Gong is mostly focused on energy cultivation, while Tai Chi additionally incorporates a thorough and detailed study of movement. Both disciplines can be easily practiced side by side and will complement each other well. Tai Chi is very different from Yoga. While both disciplines seek to still the mind and cultivate internal energy, health and longevity, their methods of achieving these goals are very different. On the physical level, Yoga is focused on the accuracy of still positions while Tai Chi is focused on the accuracy of movement (transitions between positions) and poses are generally not held in Tai Chi. The other significant difference is that Tai Chi does not involve much stretching and does not utilize pain to aid concentration or facilitate progress. The Tai Chi approach is to gently expand the comfort zone from within, viewing pain as the body’s signal of what not to do. Both methods can be practiced separately but are essentially not compatible and require very different mindsets. Tai Chi is not a free form movement or dance meditation. The movements of Tai Chi are deliberate and consciously directed. Both of these approaches complement each other well to develop a wide range of skills, but must be approached differently. The class begins with meditation to calm the mind and focus our attention. Several different meditation techniques are taught over time including breathing meditation, body awareness / mindfulness meditation, walking meditation and sound meditation. The second and main part of the class is Tai Chi. One or two exercises are taught in detail in each class, at a pace that allows newcomers to learn and remember the movements while giving experienced students additional detail to deepen their understanding and refine their technique. The students start off by learning the basic workings of the movements. Once the basics are learned the students are taught more advanced internal principles such as how to improve their balance and relaxation and how to feel and direct their internal energy. Overall, this particular class is focused on in-depth learning of the inner workings of Tai Chi as opposed to learning lots of different movements – quality rather than quantity. The participants are invited to stay for a cup of tea after the class. This is an optional part where we enjoy different teas, good conversation and sit by the fire in the winter. The first three masters are widely known and there is much information about their history and accomplishments on the internet and in books. 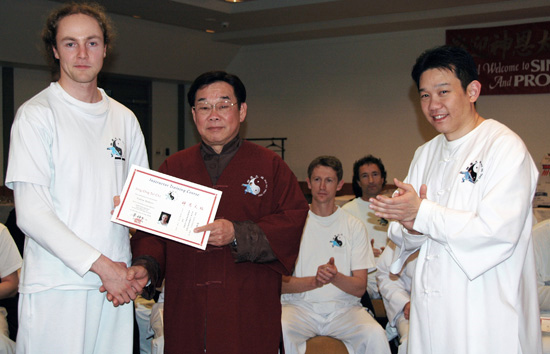 Master Yek Sing Ong learned directly from Master Huang Sheng Shyan for 30 years and was one of the 13 students awarded with Master Huang’s top certificate in Tai Chi. Master Michael Yek is his son and has been learning from his father for over 30 years. Photo: at Sing Ong Tai Chi instructors camp (2008) – Valera Koltsov, Master Yek Sing Ong, Master Michael Yek. Valera joined Sing Ong Tai Chi (Yek family school) in 1999 under Michael Yek’s tutelage and remained with the school for 12 years, doing thousands of hours of training and learning from Michael Yek, his father Yek Sing Ong and their senior students. In 2005 Valera opened Sing Ong Tai Chi branches in St Heliers and Ponsonby and ran them for over six years. In 2012 he founded Laingholm Eleven and began teaching and exploring Tai Chi independently. Valera feels that he has many years of learning ahead of him and feels grateful for the good foundation given to him by his teachers. No previous experience is necessary. In terms of physical ability, if you can go for a 15 minute walk or walk up two flights of stairs then you will be able to participate. The minimum age is 15 given a personal (as opposed to a parent’s) desire to learn Tai Chi. There is no upper age limit for Tai Chi. All visitors are expected to participate in the class, not just watch. Be sure to read the venue information page for important requirements that apply to all events at Laingholm 11, including this class. Fill out the form below if you wish to join this class. You will receive an e-mail response in the next several days. (Check your spam folder and contact us if a week has passed and you haven’t received a response). Introductory sessions are usually held on the first Wednesday of a month and everyone who is new starts by coming to one of these sessions. After coming to an introductory session you can decide whether you want to continue. There is no obligation. You are welcome to bring a friend or a partner with you, but your friend or partner also needs to read the venue information and submit a separate copy of this form themselves. Tick to subscribe to our Upcoming Events e-mail newsletter. Do you have any previous experience with physical or spiritual practice? Please describe briefly. Do you have any health conditions affecting your physical movement or mental focus that the instructor should know about? This class is held in a home studio and its environment and customs differ from public halls. Click here to read the Venue Information page (link opens in a new tab). Happy to see your article in the Roundabout. I would very much like to learn TaiChi. Thanks for your comment. Feel free to come along to the first Tai Chi session on 17th of Oct.
Finalized details will be up on the web site in early October. Hi Valera. I was very excited to see your article in the roundabout. I used to go to Tai chi classes in the UK and loved it. I look forward to attending your session on the 17th. Great to have something like this on my doorstep in Laingholm, and it creates new opportunities to meet people. Thanks for your positive feedback. Will look forward to meeting you next month. My husband Rod and I would love to join your class next Wednesday. Thanks for your message and look forward to meeting you both next Wed.
I’m really enjoying the fun, friendly and creative nature of this class. I find it gets me into a good mindset (bodyset?!) for practicing Tai Chi. I’ve done other Tai Chi classes before, but I much prefer this approach. Thank you! Greetings all, long has been my interest Tai Chi and meditation. Now that I have started participating in the Laingholm 11 classes my only regret is that I have waited so long, good things take time. The participants and the instructor [Valera] all make you feel well at ease in your own skin. Great fun in a friendly focused environment. I would like my son who is 10 yrs to learn tai chi, He is interested in the self defence part and I am interested in the balance and awareness side of it. after reading the website I was thinking that it could be something that the 2 of us could do. Would you consider a 10 year old student? Will he get a glimpse of the self defence side of it at the classes ? This class is strongly focused on developing internal awareness, calm mind and better control of the movement (balance). While these skills serve as a foundation for self defence technique of Tai Chi, we do not practice explicit self defence exercises at the beginner level. Most children are likely to see this format as boring. The earliest age for this class is about mid-teens onward. Most children are naturally active and have a lot of physical energy. Learning mindfulness and body awareness, which is at the core of Tai Chi, is very good even for children. However, they need to be taught differently – with a good amount of visually interesting and kinaesthetically stimulating activity and a smaller doze of mindfulness that they can handle without getting bored or confused. So my suggestion for your son would be to look for a Tai Chi class that is specially designed for young people, or to consider more physically active martial arts styles such as Kung-Fu. It also sounds like the class could be right for yourself and you are most welcome to try it out if you wish. I’m interested in coming along to your tai chi class. I’m interested in finding like minded people to practice tai chi. I practiced tai chi in Taiwan with both Cheng Man Ching’s and Master Huang’s schools which included white crane kung fu. Does your group practice Cheng Man Ching’s 37 step form? Feel free to come along to class and practice with us. We do not practice the form in this class (it has only been going for 5 months), but I do know 37.